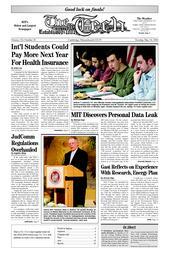 A proposal by the Massachusetts Qualified Student Health Insurance Program (QSHIP) to halt waivers for insurance policies from carriers based outside the United States could potentially require some international MIT students to buy the MIT Student Extended Insurance plan, currently priced at $1,440 a year, during the 2006-2007 academic year. Personal records, including some social security numbers, of approximately 800 members of the MIT community were recently e-mailed to an MIT mailing list, according to an MIT press release. The file containing the information was sent from the office of the vice president for research, and was received by approximately 150 people, most of whom are affiliated with MIT, according to the press release. MIT became aware of the incident on April 26. In the works since early 2004, a new set of rules and procedures for undergraduate dormitory Judicial Committees was voted on and passed by Dormitory Council two weeks ago. Important additions include a new training requirement for JudComms that wish to hear disciplinary cases and the requirement that all JudComms remain in consultation with MIT administrators. None of the current JudComms have received this training. The seven-page document addresses some of the misconceptions of the powers JudComms have, and helps to clarify their jurisdiction. Alice P. Gast, vice president for research and associate provost, will be leaving MIT at the end of this academic year to become President of Lehigh University in Pennsylvania. In the month since the April 13 deadline to apply for direct summer funding from the Undergraduate Research Opportunity Program, 327 of the 553 students who requested direct funding have received notification that they will be receiving funds from the UROP office, according to Melissa J. Martin-Greene, staff associate in the Academic Resources Center. In addition, 121 of the 226 students who did not receive direct funding have gotten it from other sources, such as a UROP supervisor or a department. The following incidents were reported to the Cambridge or MIT Police between May 5 and May 12, 2006. This summary does not include incidents such as suspicious activity, false alarms, or medical shuttles. E3, the world’s biggest and best gaming convention, began on Wednesday in the Los Angeles Convention Center and just finished up Sunday. The annual event, short for Electronic Entertainment Exposition, is a chance for companies to showcase their latest games, their newest consoles, and what the future holds for them. Even though it’s a private event, and only members of the video game industry and the media can come, the place was packed: attendance numbered in the thousands.